UPDATED: Tue., Feb. 13, 2018, 9:53 p.m. 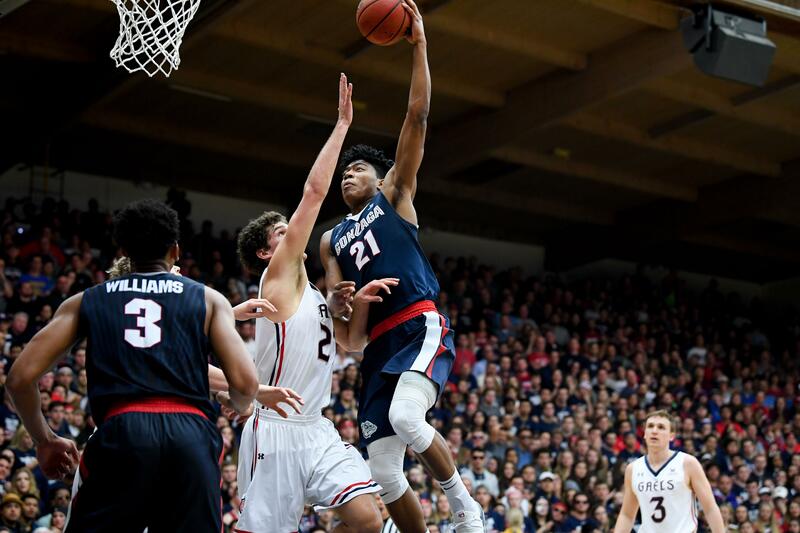 It was easy to be mesmerized by Rui Hachimura’s post-up buckets, smooth one- or two-dribble moves and silky midrange jumpers against Saint Mary’s. But it was the other end of the floor where the Japanese native demonstrated his growing comfort level in Gonzaga’s system. The 6-foot-8, 225-pound sophomore forward subbed in early and immediately guarded Saint Mary’s point guard Emmett Naar, 6-1 and listed at 195 pounds. Gonzaga’s aggressive double-teaming on star center Jock Landale and ensuing sharp rotations were the key to Saturday night’s 78-65 win. Some of the Zags’ defensive tweaks also highlighted the versatility of their bigs, including Hachimura. With 12:50 left in the first half, Landale set one of the Gaels’ patented high-ball screens for Naar. Hachimura switched onto Landale and forward Johnathan Williams took Naar. The ball found Landale in the midpost and GU immediately doubled with Williams rotating to pick up Calvin Hermanson, the nearest 3-point threat, and Silas Melson closing out on Naar, the next-closest shooter. Landale passed the ball out and the Gaels moved it swiftly around the perimeter to Evan Fitzner in the opposite corner. Corey Kispert, who had doubled down on Landale, raced across the key to contest Fitzner’s missed 3-pointer. The scenario, with various GU and Saint Mary’s lineups on the floor, played out numerous times with similar results. The Gaels, who entered leading the NCAA in field-goal percentage and ranked sixth in 3-point percentage, shot just 41.5 percent and made 5 of 20 from distance. “Rui is probably our strongest player,” coach Mark Few said. “He can guard Landale and he can guard guys on the perimeter. Hachimura’s defense is a work in progress – late to recover, he left Cullen Neal open for a second-half 3-pointer – but he’s making strides. He guarded speedy guard Jordan Ford when Naar was benched in the second half. Naar had a miserable night, missing all six of his shots in the first half and finishing with five points and two assists. Hachimura has scored 44 points on 20-of-29 shooting in two games against the Gaels. Hachimura overpowered Fitzner and Elijah Thomas. Jordan Hunter, a seldom-used 6-10 forward, had some success against Hachimura long after the outcome had been decided. Hachimura, Gonzaga’s top scorer in conference at 13.5 points, has reached double figures in 12 of the past 14 games. He’s showing more patience, taking higher-quality shots and applying foul pressure. He’s attempted a team-high 49 free throws in WCC play, making 80 percent. The only thing Hachimura hasn’t done is knock down 3-pointers (4 of 22), but he’s rarely asked to do so with favorable matchups closer to the hoop. Hachimura has been an effective 3-point shooter on Japanese national teams. Hachimura’s overall development is pretty much on schedule. Published: Feb. 13, 2018, 6:57 p.m. Updated: Feb. 13, 2018, 9:53 p.m.